The SW Idaho Chapter of the National Association of Residential Property Managers (NARPM), which meets in Boise every month, recently posted their 3rd quarter rental vacancy survey results for Ada and Canyon counties. We have displayed some of the graphs and charts below. The market continues to prove us wrong, in that we expected to see rents soften this 3rd quarter. The vacancy rate for Ada County single-family home rentals as well as multi-family rentals is about the same at 3.4%. The average rents posted for single-family homes seems to be in line with what we have seen in the market. There were only 18 companies that reported their rental data and, based on the average rents shown for the multi-family units, I believe the rents are skewed upward and likely being influenced by a large number of brand new properties. In comparison, FRPM's current vacancy rate is half of 1% (.005), which is great. For those of you who are regular readers, you know that FRPM recommends to the property owners to not allow leases to expire in the fall and winter months, so our low vacancy is due to design. Typically such a low vacancy rate would indicate that rents can be pushed up a bit. Perhaps, but we find that it's best not to push up in these winter months, because if the property doesn't rent right away, it could sit for months. The purpose of this survey is to show vacancy and rental rate trends among single-family homes and multi-family units (2-15) in Ada and Canyon County. Survey results are displayed by type (single or multi-family) and bedrooms (1-5) for the respective county. Property status was surveyed as of September 30, 2015. Data from a total of 18 property management companies were included in the survey results, which accounted for a total of 5074 homes: 2392 single-family and 2682 multi-family. The accuracy and reliability of this survey is improved with an increased sampling. Vacancy rates moved down slightly to 3.6% for the 3rd quarter of 2015. This is a decrease of .3% from last quarter. The largest decrease in vacancy rates from last quarter was multi-family homes in Ada County. Canyon county multi-family had a decrease of .2% and single family homes where unchanged. Rental rates in Ada County increased on the average of $22 for single family homes. 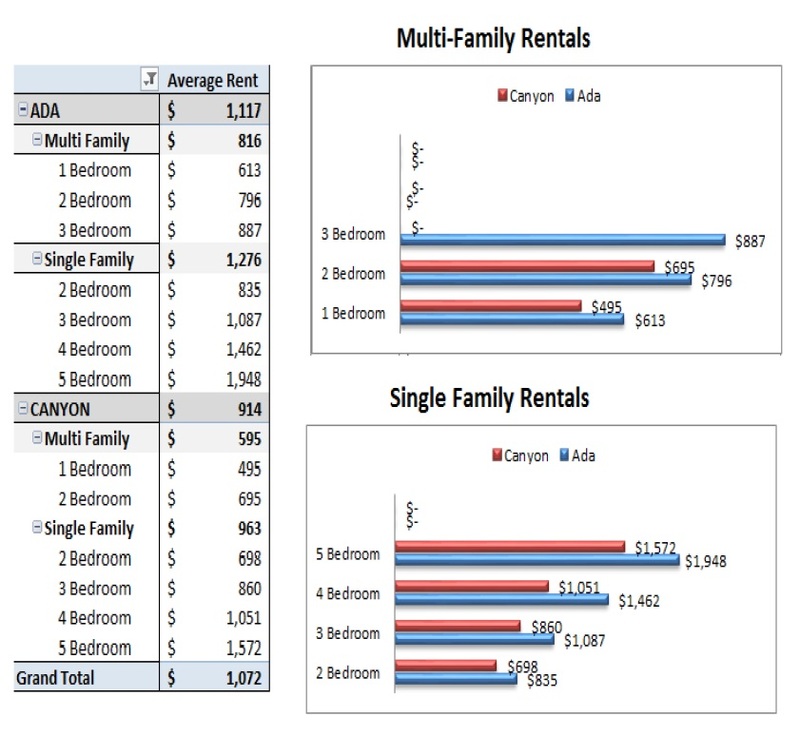 There was an overall increase of $82 in rental rates for multi-family homes, in Ada County. On the average Ada County showed a $33 increase in rental rates over last quarter. Rental rates in Canyon County showed an average increase of $54, from last quarter. The increase in rental rates for Canyon County was solely due to the increase in rates for 5 bedroom single family homes. 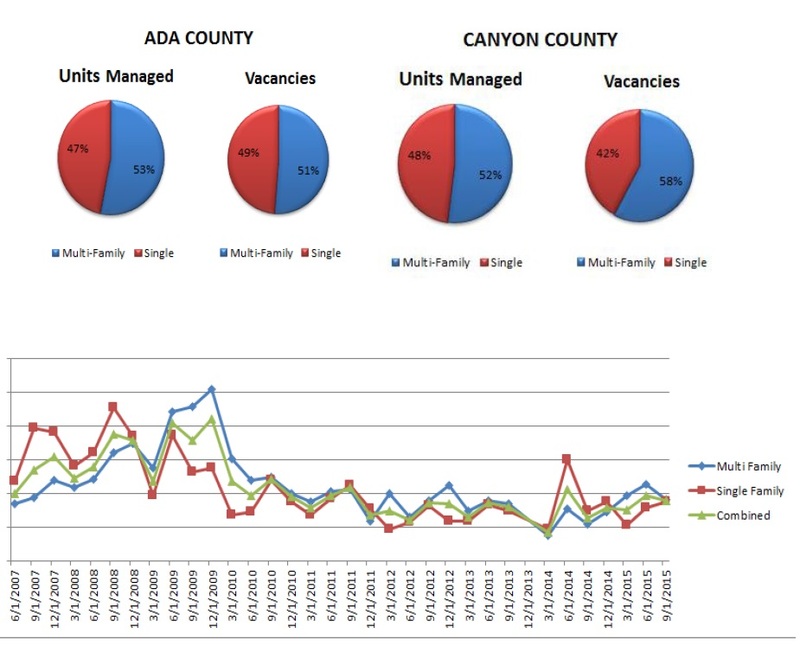 Both Ada and Canyon County experienced the vacancy decreases for the 3rd Quarter of 2015. Although both counties experienced the vacancy decrease, Ada County had the higher reduction in vacancy rates by a full .4% over last quarter.